Show your Earth Day support to the whole neighborhood by hanging an Earth Day flag outside your door. Flags were created for the very first Earth Day in 1970 and are a fun way to show your true colors. There are numerous flags available to show environmental support and can be flown proudly for Earth Day or any day. There are also two styles of flags that are used and associated with Earth Day. Both styles were created for the original Earth Day teach-in, although neither was ever commissioned in an official capacity. The blue Earth flag is the simpler and more straightforward design of the two. The blue flag has a marbled background and boasts an image of the Earth as seen from space. The original flag designed by John McConnell used only two colors, white for clouds and blue for both the land and the ocean. Today's Earth flag design shows a more realistic Earth set against a deep blue background. No slogans or other information is added to the flag, making it both a subtle but affective symbol of support for Earth Day. Because of its simplicity, the Earth flag is also used as a generic flag for environmental awareness. The flag design is in the public domain, which means it can be printed and used by anyone. 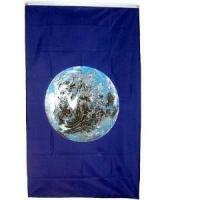 As a result, you can find numerous Earth flags for sale from retailers like Amazon and EarthFlag.net. The second flag associated with Earth Day is the ecology flag. This flag was designed by cartoonist Rob Cobb for publication in the Los Angeles Free Press. The Theta Ecology Flag uses the Greek letter "theta" in yellow against a green and white background. The flag is designed to incorporate the letter's E and O for Environment and Organism, and is patterned after the United States flag, with 13 alternating stripes of white and green. A green square in the upper left corner holds the theta symbol. A high school student, Betsy Vogel, took Cobb's design and sewed the first Theta Ecology Flag for Earth Day. Vogel was originally denied the right to hang the six-foot flag and petitioned the Louisiana State Legislature for permission. This was granted and the flag was flown at her high school in time for Earth Day. This flag design also entered the public domain, and is available from retailers like USFlags.com and GettysburgFlag.com. Picture of the Earth and the words "Earth Day Every Day"
An ecology flag printed with the phrase "Not Just for Earth Day, But Every Day"
The Earth wrapped in a recycling symbol and the slogan "Help Save Our Planet, Recycle"
A tree and slogan, "Go Green, Give Back to Mother Earth"
Whether you choose an older flag style or one of the newer designs, show your enthusiasm for Earth Day by flying your flag proudly. Hang your flag in front of your door not just on Earth Day, but everyday to demonstrate to your friends, family and neighbors your concern for the environment.